Almost there! The build is completed and painted. I got the legs attached. Still waiting for the digital plunger and motion kit. I wasn’t too pleased with my spray-painted custom art that is show in the photo above. I am had a custom vinyl decal printed through Shutterfly to use as the sideart. I used Photoshop to create the image below. Decided to build my own Visual Pinball Cabinet. 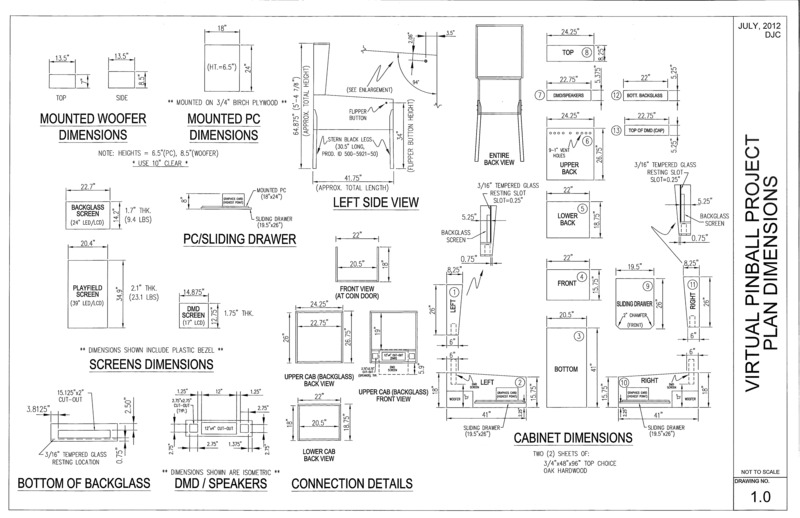 I found these plans to base my cabinet on. I am using an old 20″ monitor for the backglass and a 32″ LCD flat-screen TV for the playfield. I will be using Hyperpin as my front-end for Visual Pinball and Future Pinball games. So far, so good. I am waiting on some arcade parts before I can finish the front and button panels.